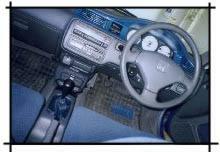 When I purchased my EG4 Civic hatchback in 1998, I loved everything about it, the body interior and engine were all in excellent condition. However, there was one thing that I would not have chosen: the automatic transmission. 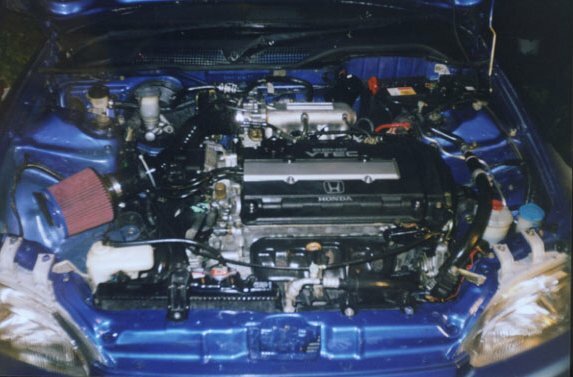 The original engine was a JDM D15B SOHC VTEC, rated at a respectable 130 p.s. especially for a 1500 cc! So I started my research on the net to find out my options with respect to getting the car converted to manual transmission. In my search, I discovered Eric's B16A site and the Hybrid site among others. So I began to think, why go through the trouble of changing the transmission on the 1500, might as well go for it an put in a DOHC 1600cc VTEC and gain 40 hp in the process! I considered a B18C but those engines are rare and expensive in Trinidad. 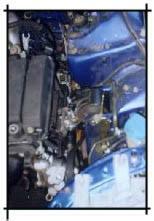 In any case the JDM second generation B16A puts out the same horsepower, with a bit less torque. 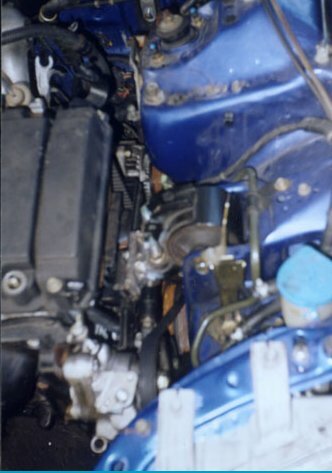 From what I had learned on the Internet I knew the engine would fit fine. Also because my car originally came with a VTEC engine, I knew that the wiring would not be very difficult. I read as much as I could find on swaps, and tried to plan the operation to the best of my ability. Let me point out, that there is no substitute for good information, so if you are planning any sort of hybrid, read as much as you can BEFORE you start; web sites, FAQs, articles, magazines, whatever. 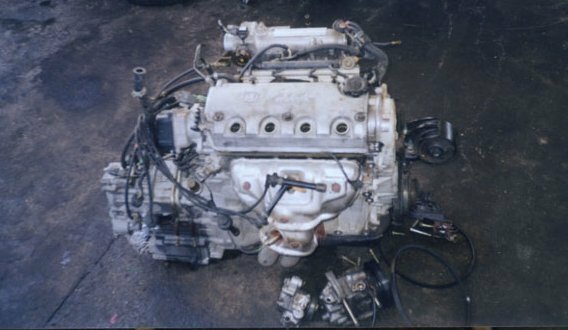 I chose to have a local shop with considerable Honda experience do the work and I was able to locate the engine from a local importer. I knew that it would be best to purchase the engine and accessories as a package, and that's just what I did. 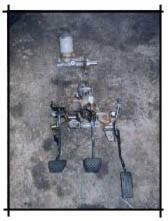 But I focussed on the big items, Engine, Y21 LSD trany, ECU, Complete engine wire harness, axles, and in so doing, I did not even realize that the engine did not have the mounts! (No AC unit either!) Now although In my country we have quite a brisk trake in JDM parts, some things are almost impossible to get, like mounts! The solution? Alter the original D15B mounts to fit. That mistake made a project that would have taken a little less than two weeks, last five weeks. You could imagine how my wife loved me for this! The mounts took a really long time to complete, plus as you would expect, my car wasn't the only one in the shop! 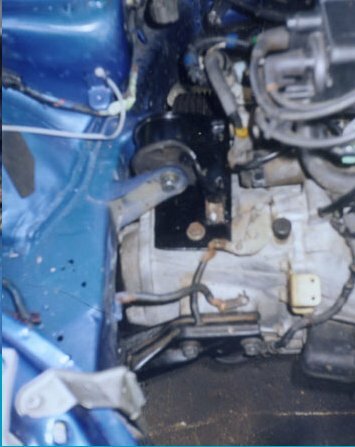 Anyway, it turns out that the rear (center) engine mount could be used on the B16A. I was able to get a front transmission mount, leaving three mounts to be custom adjusted. By the way the lower front engine mount / ac bracket on the B series motor is totally different to the D series mounts so I fabricated an adapter flange to accept my old AC unit. (No way did I have intentions of buying an AC) . Now the Automatic Specific facts. 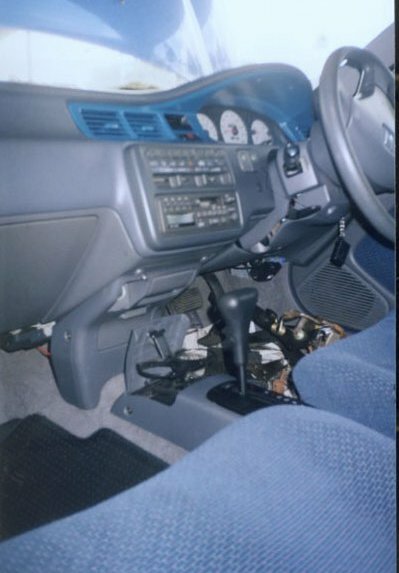 Remove the Automatic Gear Lever and toss it! There is a plastic slider underneath which is connected to the car's harness. This slider should be set to the PARK position and locked there by some means. The guys at the shop put a big blob of silicone sealant over mine. 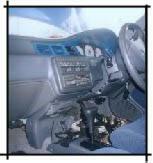 This is necessary if you plan to take your key out of the ignition after you drive!! Also on the plastic slider, there are two wires soldered near the center of the device (yel, blk/grn). When these wires are shorted they activate the reverse lights and chime. (At least my car has a reverse chime). My advice is to find the reverse sensor on the transmission, trace them to the connection junction on the right side of the engine bay, then run a pair of wires from the reverse sensor leads to the plastic slider. Voila! Your reverse lights will work fine. Of course when you remove the automatic gear shifter, there will be a gaping hole under there. I found that my car did not have any mounting holes for the shift linkage. This is good in a way, as you get to choose where the shifter will lie. I used a CRX shifter in my application and just bolted it on through the sheet metal in the floor arch. 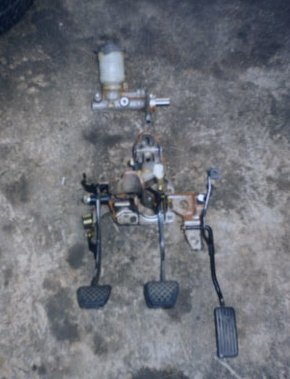 Depending on the linkage you use, and the plastic moldings that you choose to put over the shifter, some adjustment of the linkage length may be necessary. 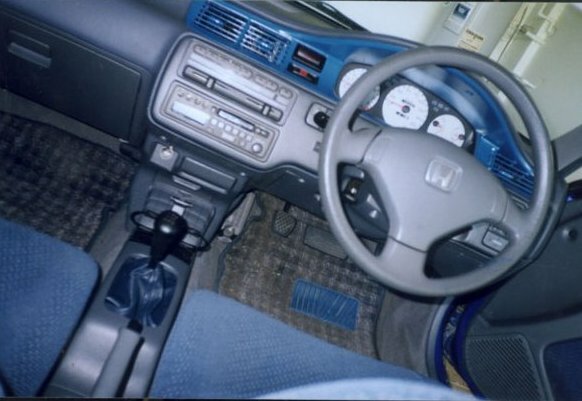 You will see a picture of the pedal box from a CRX on the left. If you are really observant you will notice that this pedal box is made for a cable clutch system. The verdict: scrap the idea of changing the pedal box. The guys cut off the clutch pedal, and welded on a hinge so it could be used to actuate the plunger on the clutch master cylinder. We used a soft line to connect the slave cylinder (on the trany) to the hard line, which connects to the clutch master cylinder. Very simple. 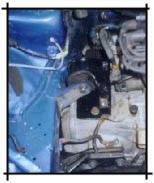 In the interior picture you can see the large (AT) brake pedal next to the clutch. The car works beautifully and is a joy to drive. Every feature and sensor is operational. Since I kept the original AT housing around the shifter I did not loose one of my favorite features of the car; the fold in cup holder! The shifter boot is custom made from Italian leather. I also got the white faced gauges with the deal! I would really advise against swapping in the other direction though since all the car's wiring behind the firewall would have to be changed in order to get a fully functional (all features working) automatic.